^ "Frisia". Encyclopædia Britannica Online. Retrieved April 16, 2019. 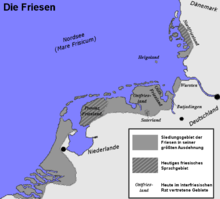 Frisia is the traditional homeland of the Frisians, a Germanic people who speak a language closely related to English.